A perfectionist chef doesn’t get much sleep in the days leading up to the opening of a new restaurant, thanks to the critical and time-consuming task of developing dishes that will delight the eye as much as they thrill the palate. He gets less still when he also happens to be the restaurant’s business owner, lead designer, project manager, human resource director and public relations specialist. The recommended six or seven hours of shut-eye each night? More like two or three. It’s understandable, then, that Dave Racicot looked a bit ragged about the edges late last week at Notion, his 38-seat restaurant opening Friday in Oakmont. The masking tape that just two weeks ago marked where to place furniture has given way to actual tables and comfy, upholstered chairs. But there’s still the matter of finalizing purveyors. Equipment malfunctions. A headache-inducing stack of tax and payroll forms requiring signatures. And damn! Why doesn’t anyone want to take the pizza oven that’s monopolizing his undersized kitchen off his hands? “Construction worker, electrician, painter, designer, CFO, CEO, logistics, dishwasher … I’ll make time for chef eventually!” he posted Dec. 16 on Notion’s Facebook page. Add a commute from Uniontown that keeps the 31-year-old chef on the road three-plus hours a day and, well, you’d probably have a few circles under your eyes, too. At least there were no worries about the food, images of which he’s been sketching in his head for months, if not his entire career. People eat as much with their eyes as their mouths, Mr. Racicot explains. So, along with the exact amount of Terra Spice Company seasonings to enhance a food’s flavor — each measured to the 100th gram — he’s spent countless hours perfecting his garnishes and plating techniques. Most turn up as sketches in the black idea book that’s never far from his side. A working menu pried out of his reluctant hands on Dec. 22 (he wouldn’t actually kitchen-test any of the recipes until two days ago ) reads more like poetry than weird science: Elysian Fields lamb smoked in hay. Chicken dressed in textured hazelnut oil. Lobster “au natural” with textures and forms of coconut. Manchego with pistachio custard and poached quince. 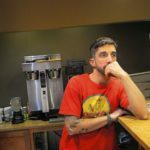 It’s a far cry from the simple pastas and boxed tacos he cooks for his three kids for dinner, and further still from the foot-long hoagies he’s been wolfing down, late at night, during the two-month renovation of the former Boulevard Bistro. But it’s perfectly in keeping with the forward-thinking dishes the Indiana, Pa., native created at Lautrec. Prices will run between $24 and $34 for an entree, with the chef also offering a 7-course tasting menu for $75 ($99 paired with wine). A sommelier will suggest wine pairings. Pastry chef Josh Lind, sous chef Andrew Stump and cook Joshua Neeley will help with the cooking, but menu development is his alone; his creative persona, Mr. Racicot admitted on Tuesday, doesn’t mesh with “random ideas” being thrown around. It’s a culinary doctrine that appeals to the faithful: Manager Jennifer Jin, who’s also working on a degree in computer science at the University of Pittsburgh, has taken more than 50 reservations for tomorrow’s grand opening. Customers have purchased gift certificates, too. “So, even before we’re open, we’re actually making money,” he notes with a grin. Unlike some chefs, Mr. Racicot didn’t grow up in a rich culinary environment. There was no backyard garden from which to pick fresh veggies, no expansive grocery lists or relationship with a local butcher; food, he says, was more about subsistence than enjoyment. That said, he speaks fondly of going with younger brother Ryan, executive chef at Longue Vue Club in Verona, to their Italian maternal gram’s house in Homer City for fresh pasta on Sundays. He also remembers making crepes at age 6 with Memere, his French grandmother on his father’s side. “I’d stand on a footstool in front of her stove,” he says. Had he liked washing dishes at the Holiday Inn as a teen, Chef Racicot might never have tried his hand at cooking. But man, did he despise being a “dish pig,” and before long he was on the hotel’s line cooking omelets and French fries. By age 20, he’d been promoted to executive chef. A job at Nemacolin’s Golden Trout soon followed and this, he says, is where he learned much of his craft, first by watching and then by doing. He read voraciously about food, devouring Thomas Keller’s “The French Laundry Cookbook” so many times that to this day he can recite entire passages. 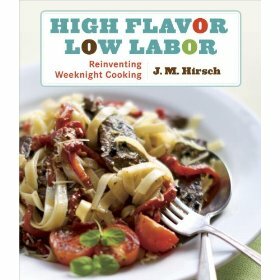 “For me, it was very important to understand how chefs thought, and organized their kitchens,” he explains. In 2003, Mr. Racicot turned in his chef’s coat at Nemacolin, packed up his wife, Kelly, and two children, and headed west to Las Vegas, where Julian Serrano was stretching the boundaries at Picasso, a AAA Five Diamond restaurant in the Bellagio. As he explained to Chef Serrano in the certified letter he sent him the same day he gave notice at Golden Trout, he needed to work for someone who was passionate about food if he was ever going to make a name for himself in the business. It took six long months, but eventually Mr. Serrano offered him a cook position. 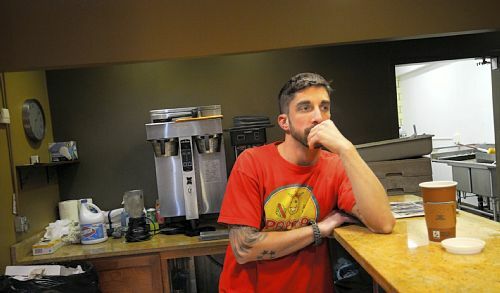 Two years later, a more experienced Chef Racicot was back at Joe Hardy’s resort in Fayette County, the new chef de cuisine of Aqueous. In 2007, he took the reins at Lautrec and within a year steered it to its Five Diamond rating from AAA. He’d work there for the next three years. The experience of maturing his craft in one of Western Pennsylvania’s top kitchens was unparalleled, which is why the split last January wasn’t exactly a happy one. “I was given an opportunity to just cook,” says Mr. Racicot. “No one told me what I had to do or put on the menu.” A wistful smile creeps across his face. Chef Racicot’s goal at Notion is to create the same progressive, modern American food that made the folks at the James Beard Foundation take notice while he was at Nemacolin. For the most impact, the menu — to be previewed at an invitation-only soft opening this evening, with staff sampling it yesterday — includes just 12 extremely focused items; diners, he says, also can expect flawless service. To err might be human but not in Chef Racicot’s kitchen, even on the first day of business: If you allow people an opportunity to make mistakes just because something is new, he notes, it changes the mindset. “I don’t have the capacity to give myself any wiggle room,” he says on Tuesday afternoon, cool as a cucumber in his crisply starched chef whites — despite the fact that two days out, he was still writing recipes and compiling shopping lists. It helps that most of Mr. Racicot’s staff has previously worked together, and enjoy the team mentality and easy camaraderie that keep a commercial kitchen functional. Any butterflies are best left to apprentice Graham McCollum, an 18-year-old senior at Riverview High School who’s busy trimming a big bowl of brussels sprouts. Back to the food. Some of Chef Racicot’s creations were as simple as blinking: To envision the dish, all he had to do was close his eyes. Others are elaborate, intellectual works of art with as many as 14 garnishes and a marriage of textures and flavors. A broccoli starter, for instance, combines a puree made from the very green tops and stems slow-cooked in butter with toasted barley and scalded milk froth. Lamb will be unveiled in a small cloud of smoke to tickle the olfactory receptors. Many ingredients will be locally sourced, of course. Just don’t expect Chef Racicot to use Farm to Table as a marketing tool because rather than try to make people “feel good” about their food choices, his aim is to provide the freshest food from the best possible sources. Nor will he allow diners to substitute. Some customers might not appreciate such artistic integrity. But if Chef Racicot accomplishes what he has set out to, he says everyone who dines at Notion will leave the table happy. No one’s going to blame you if you don’t feel like cooking a big meal after the holidays. This easy recipe starts with a store-bought rotisserie chicken — God’s gift to the busy and/or weary home chef. The original recipe calls for serving it with couscous, but I think it would taste even better with fragrant Basmati rice or scooped onto warm naan bread, which you can find in most large grocery stores. Don’t be afraid to add more curry powder or a dash of cayenne pepper if you prefer things a little spicy. In a small saucepan, bring water and 1 tablespoon olive oil to a boil. Turn off heat. Add couscous, stir, then cover and set aside. In a large deep skillet, heat remaining 2 tablespoons olive oil over medium-high heat. Add onion, red bell pepper, garlic, carrots and raisins. Saute until onions and pepper are just tender, about 5 minutes. Add curry powder and cook for 2 minutes. Add chicken and coconut milk. Bring to a simmer. Season with salt and pepper. Transfer the couscous to a serving bowl or platter. Spoon the chicken curry over couscous, then garnish with scallions and cilantro. Crunched for time? Time to get two meals out of your recipes. 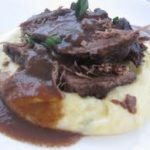 I served this delicious pot roast on day one, as Food Network cooking star Giada De Laurentiis suggests, with a cheesy polenta. The next day, I chopped up the leftovers and sprinkled them along with cheese, chopped fresh tomatoes, pickled jalapenos, onion and a little salsa on a bed of tortilla chips. Five minutes under the broiler and, voila, pot roast nachos! Pat beef dry with paper towels and season with salt and pepper. In a heavy 6-quart pot or Dutch oven, heat 2 tablespoons oil over medium-high heat. Add beef and cook until browned on all sides, about 12 minutes. Remove beef and set aside. Reduce heat to medium. Add remaining oil and onions. Cook, stirring frequently, until tender, about 8 minutes. Add garlic and cook 1 minute. Add wine and scrape up brown bits clinging to the bottom of the pan. Stir in broth and mushrooms. Return beef to pot and bring liquid to a boil. Cover pot and transfer to oven. 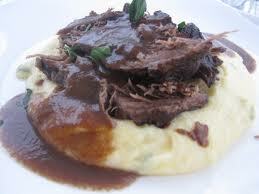 Cook until meat is fork-tender, about 3 hours, turning beef over halfway through and adding more broth, as needed. Transfer beef to cutting board, tent with foil and let stand 15 minutes. Meanwhile, spoon any excess fat off the top of the pan juices. 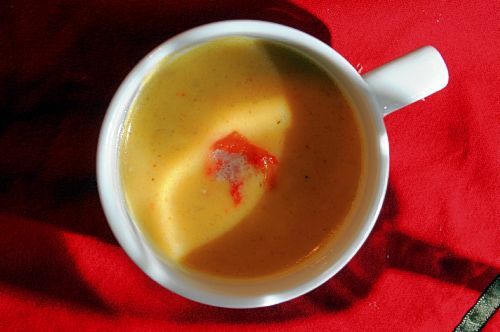 Using an immersion blender, blend plan juices and vegetables until smooth. Add rosemary and thyme. Bring sauce to a simmer and cook for 5 minutes. Season with salt and pepper to taste. Cut beef into 1-inch pieces and place on platter. Serve with sauce on top or on the side. Not loving the snow and below-freezing temps? 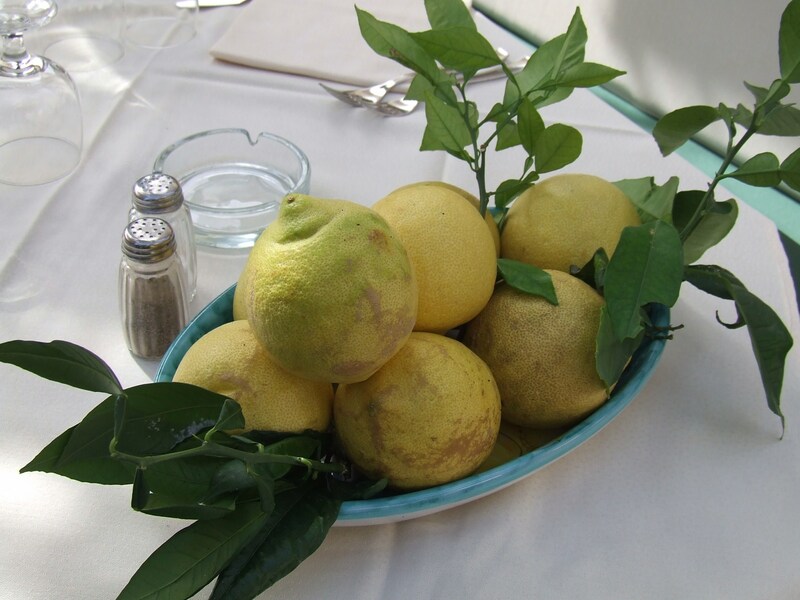 There’s nothing like citrus to chase away the winter blues. This velvety, and super-quick, pasta dish is brightened with a liberal dose of lemon zest. 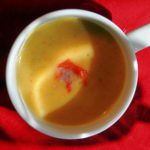 Cream-based sauces are supposed to be silky and just fluid enough to coat the pasta, so be sure to plate it immediately, or the sauce will coagulate and bind to the pasta, making it lumpy. Serve with hot, crusty bread and a simple green salad. Bring a large pot of salted water to boil. Add pasta and cook until al dente. Meanwhile, place egg yolks in a large bowl. 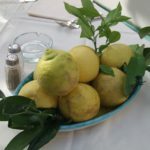 Grate the zest of 1 lemon into the bowl. Add cheese and pepper, whisk to combine, then whisk in cream, milk, parsley, chives and generous pinch of salt. When pasta is al dente, drain and return to pot. Immediately add egg mixture and toss together to combine well, then divide among serving bowls. Grate fresh lemon zest (from remaining lemon) and cheese over the top. Serve immediately. The sun had barely started its creep toward the heavens when the Rev. Father Mike Zavage positioned himself against a tree, his .284 Winchester hanging at the ready on his right shoulder. Gusty winds made the 18-degree air feel more like an ungodly 2 degrees, but the 28-year-old priest was smiling, happy to finally be in the woods on this, the ninth day of deer season. Insulated boots and gloves kept his extremities from turning to Popsicles while he stood, silent and still, for hour upon hour in the hillside hunting spot he’d scouted months before, when these state game lands in Greene County were still green with leaves. Warming his soul was the fact that his father, also named Mike, was trekking through the snow somewhere nearby. Mr. Zavage had already bagged an 8-point buck the day before in the same stretch of woods, so his job this wintry day was to drive deer out of the brush toward his son and fellow hunter Mike Venesky, 25, of Baldwin Township. “You want to try to create a shooting lane,” Mr. Zavage explained in the pre-dawn darkness, as the hunting party tuned their walkie-talkies to the same channel. It would be two long and chilly hours before they’d actually use them, and then only to agree that it was time to change locations. Deer hunting for many is a solitary sport, but in the Zavage household it has always been a shared experience. 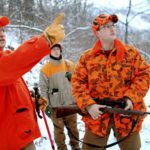 Father Zavage, parochial vicar at St. Anne Catholic Church in Castle Shannon, was born on the first day of buck season in 1982 and has been hunting with his dad since he was 12. His father, in turn, learned the sport at the same age from his father, Andy, who owned a grocery store near Uniontown. Back when he was a kid in the ’60s, the group typically included a half-dozen or more dads, uncles and brothers all going out together, Mr. Zavage remembered. All but one of his brothers is now deceased. So the fact his only son is out here with him, well, “it’s good you can pass it on,” he said. Deer hunting is popular enough in this corner of the state that countless boys (and some girls) take off school on the opening day of buck season, which this year fell on Nov. 29, the same day doe season began. But a priest who hunts? Some might find that upsetting; St. Frances of Assisi, after all, is the Catholic Church’s patron saint of animals. Father Zavage understands he’s more the exception than the rule; he knows of only one other priest who shares his passion for deer season, and this year he had to pass up the chance to join Father Zavage because of a funeral. Yet when you grow up in Greene County — God’s country, as he likes to tell his parishioners — hunting isn’t so much a hobby as a way of life. Hunting is also a way for men who find it difficult to tell one another how much they care to demonstrate it. In his Father’s Day homily this past June, Father Zavage recounted for his congregation how last year, his father couldn’t hold a gun because he’d had shoulder surgery. Instead, he spent many hours over several days trying to drive deer toward his son. On the last day of hunting season, with his help, his son bagged a button buck. Father Zavage argues there are two kinds of hunters: those looking to get the biggest trophy buck they can and those who do it only for the venison. He and his father fall into the latter category. To that end, anything they kill ends up on the kitchen table in form of chili, steaks, stews, roasts and a jerky so delicious that all three of his sisters fight over it. True hunters, Father Zavage added, should be viewed as stewards of the environment in that they’re helping to thin overpopulated deer herds in a humane and controlled fashion. If people didn’t hunt, many of those deer would end up starving to death, he said. Truth be told, he said with a laugh, vehicles are probably more dangerous to the deer population than his rifle, which was passed down from his grandfather. “My mom hit an 8-point buck in a parking lot,” he said. 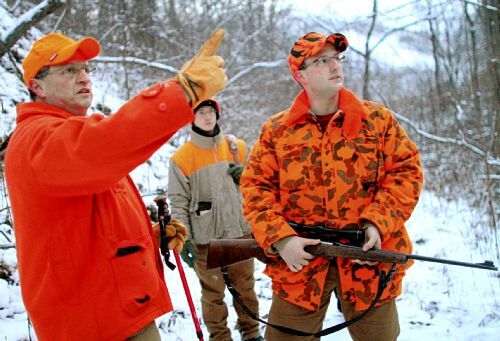 To wit: Neither he nor Mr. Venesky got a single shot off during more than eight hours of hunting, despite changing locations several times and Mr. Zavage’s tireless deer drives. But that, he noted with a sigh, is just the nature of the sport. “It’s hit or miss every time,” he said. No hunter likes to get “skunked,” of course, so it helps that the Zavages view hunting as a team sport; whoever gets the first deer then has to push. They also share in each other’s victories. Father Zavage wasn’t there to help his father drag the 140-pound buck he bagged out of the woods, but he still considers it a notch in his hunting belt. Even when both come home empty-handed, Father Zavage said he and his dad can’t help but have a good time. The experience of being out in the woods, with nothing but your thoughts and prayers to keep you occupied, is as spiritual as being in church. Tradition plays a huge role in most Italian homes during the holidays, both in the family activities that define the season, such as decorating the tree, and the favorite foods that show up without fail on the Christmas Eve and day dining room tables. Lidia Bastianich, for one, can’t imagine Christmas dinner without at least a few of her five grandchildren in tow and a roasted loin of pork stuffed with prunes in the oven, along with a side dish of brovada, a sort of turnip kraut made with shredded pickled turnips sauteed in a pan. “And we always have capon soup,” said Ms. Bastianich at a lunch last month in her Strip District restaurant, “and lots and lots of vegetables,” a testament to her childhood in Istria, a peninsula in the northern Adriatic that once was part of Italy but today is Croatia. As recounted in her charming new children’s book “Nonna Tell Me a Story” (Running Press, Oct. 2010, $15.95), it also wouldn’t be the holidays in the Bastianich household without the intoxicating scent of roasting nuts in the air, or homemade sugar cookies hanging from pretty ribbons on the tree. Both culinary traditions are among her most vivid memories of the simple but oh-so-wonderful Christmases she experienced at her grandparents’ farm in the rural Adriatic countryside, where Nonna Rosa was such a good organic cook that even the pigs got a daily hot meal (potato peels and other table scraps). With a half dozen cookbooks and as many restaurant openings under her belt, Ms. Bastianich has proven herself a pretty darn good cook, too. When there’s grandchildren in the house, though, even the most delicious batch of cookies will only get you so far. Kids also tend to like grandma’s stories. Told over and over and over again. This year, she decided to commit those memories to paper, and with winning results. Written in a voice that perfectly captures Ms. Bastianich’s down-to-earth personality and always-present smile, it pairs sweet illustrations by Laura Logan with the heartwarming tale of what Christmas in Italy’s old country was like: in a nutshell, more about family togetherness than presents under the tree. To that end, the author and her brother scout the best juniper bush for a Christmas tree, make cookies for decorations and string wreaths with fruit, dried figs and bay leaves. 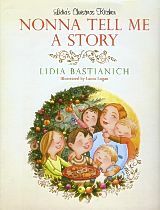 The tale Ms. Bastianich tells is so endearing that her grandchildren, who in real life consulted on the illustrations, decide they want the same kind of Christmas celebration at the end of the book. 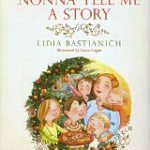 Meant to be read aloud, “Nonna Tell Me a Story” is best suited to young children. Most of its 16 holiday recipes (primarily cookies), however, will require an adult helper in the kitchen. But that’s the point of the holidays: to create memories by doing things together. Ms. Bastianich said she hopes the book will encourage readers to pass down their own family traditions to the next generation. These stuffed crepes are just as good for dessert as they are for breakfast. We made them with frozen strawberries (thawed, of course) and fresh whipped cream. Yum! In a bowl, whisk the eggs. Add milk, club soda, sugar, salt and vanilla. Whisk well until the sugar has dissolved. Gradually sift in the flour to form a batter about the thickness of heavy cream. Stir in the melted butter and the citrus zest. In a 6- or 7-inch nonstick pan, heat 1 tablespoon oil over a moderately high flame, pouring off the excess. Tilt the heated and oiled pan at a 45-degree angle to the floor and pour in a scant 1/4 cup batter at the top. Twist your wrist in a circle and allow the batter to cover the bottom of the pan in an even layer. Return the pan to the heat, reduce heat to medium and cook the crepe until lightly browned, 45 seconds to 1 minute. Flip it carefully with a spatula and cook the second side until brown spots appear, another 30 seconds or so. Flip the crepe onto a plate and repeat with the remaining batter, lightly brushing the pan with oil as needed. Fill crepes with desired filling, then roll or fold into quarters. Top with confectioners’ sugar, whipped cream, berries or nuts. Makes about 2 dozen small crepes. If you want to hang these chocolate butter cookies on the tree, use a drinking straw to punch a hole on the cut cookies before baking. If you prefer a dusting of confectioner’s sugar to royal icing, be sure to sprinkle it on while the cookies are still warm. Whisk together flour, cocoa powder, baking powder and salt. Beat butter and sugar with an electric mixer until pale and fluffy, about 2 minutes, then beat in yolk and vanilla. On low speed, mix in flour mixture just until a dough forms. Divide the dough in half, flatten each piece into a disc and then chill them, wrapped in plastic wrap, until firm, for 2 to 3 hours. Bake cookies until firm and slightly puffed, about 10 minutes. Cool cookies on the baking sheet for 5 minutes, then transfer to a rack to cool completely. (The cookies will crisp as they cool.) Make more cookies with remaining dough and scraps, rerolling scraps only once. 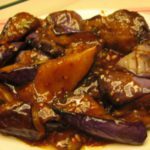 Eggplant is often served as a side dish, but it also makes for a great vegetarian entree. It’s especially delicious when smothered in a flavorful sauce, such as this sweet/hot Sichuan-style garlic sauce. Scallion pancakes or take-out spring rolls round out the meal. Sichuan food is meant to be spicy, so for the proper sting, be sure to add the chili oil. Remember also that eggplant can be bitter, so salt and then press the sliced fruit between paper towels before frying to draw out bitter juices. Make sauce by mixing soy sauce, sugar, vinegar, rice wine and white pepper in a small bowl. Set aside. Heat a large wok over high heat. Add enough oil to come about 11/2 inches up the sides of the wok, and heat to 325 degrees. 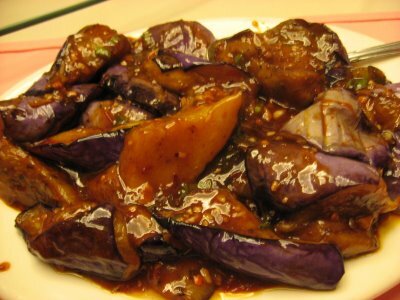 Add the eggplant and stir-fry just until it softens but still holds its shape, about 3 to 4 minutes. Remove from pan with a slotted spoon or strainer. Return wok to high heat. Add scallion, ginger and garlic and stir-fry until fragrant, about 10 seconds. Add hot bean paste and soy sauce mixture, and stir-fry for 15 seconds. Add eggplant and stir-fry until the sauce is boiling and the eggplant is hot, about 1 minute. Add cornstarch mixture and stir until the sauce thickens, about 10 seconds. Add chili oil, if using, and stir-fry for 10 seconds. Add the sesame oil and serve immediately, alone or over white or brown rice.